He was totally joking, obviously. I’d get a drink with this kid. He’s a pretty chill dude. 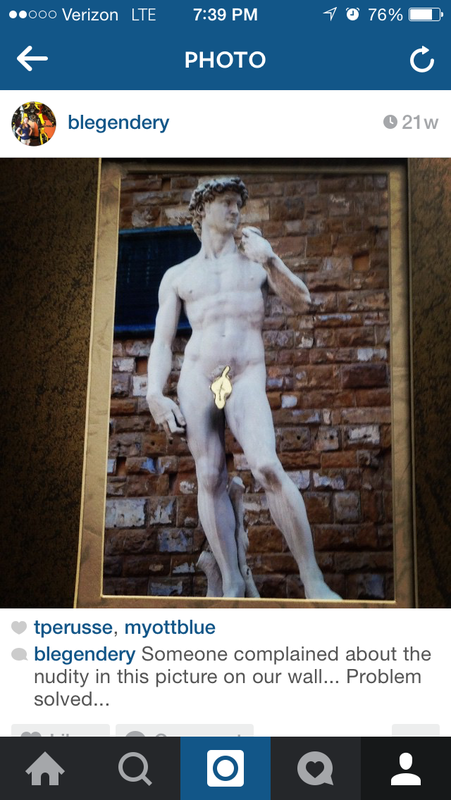 And then he tried to tell me that I wouldn’t draw a fig leaf and put it over the picture. Well jokes on you kid! Because I did! It took a couple of tries to get the right sizing, but in the end it all worked out. The reason I bring this up is because finally someone saw it and said something today. I’ve been waiting 21 whole weeks for this moment and it felt just as amazing as I had imagined. That kid hasn’t come in to the office since that day, but now I feel like I have to call him tomorrow and let him know.